So for the first time in my life, at age 32, I found myself finally establishing a primary care physician. I had of course thought about doing this for a while. My MO would be to just think about it and be satisfied with that. However one of my (less interesting) jobs medical records department. Every day I see the gory details of waiting to long. Plus my girlfriend at the time was real concerned about my health. To be honest it was probably the girlfriend that did it. I was briefing my new doctoron my health history. I brought up that I “had” ADHD as a kid. She asked me how it affected me today. I thought that was an odd question because I was always told it was something you grow out of. I said “well don’t know, it helps me be creative and funny…” I started to search my brain for other things but the conversation moved on and so did my attention. I thought about it a few times in the preceding weeks but I mostly just thought it was funny. In the past I would joke about being ADHD but I never took it seriously. I have been a podcast enthusiast since ’08 and have the great fortune of being able to listen to them at my med rec job. By the end of my work week I usually have gone though all my favs. The last day of my work is a huge 12 hour shift with only about 5 hours of real work. Not good. So I decided test out some new [pod]casts and hopefully find a few that interested me. I saw your show on the new and noteworthy section, and thought “oh lets see what’s going on with the ADHD kids.”It was show 7 on procrastination. Part way through the show you said something to the effect of “boredom is extremely uncomfortable.” And that this isn’t so for “normal people.” “It’s not?” I thought. Boredom for me can be almost painful. When I got home I googled symptoms and was blown away. I discovered the fundamental duality of the ADHD brain. Amazing benefits pared with often crippling liabilities. That same duality was my life. I have the great fortune of leading an incredibly fulfilling life, in an active community member and work on many amazing projects. I’m also a journalist, editor, graphic designer, and poet. I have garnered a fair about of respect from my peers and on the surface seem successful. However the other side of my life is a complete mess, divorced, horrible credit, bad health, bad at relationships, the list goes on…I am the senor editor of a hip local arts and culture mag, and that is just one non stop party. One of my biggest problems was alcohol. It was ultimately just self medicating im sure, but it exacerbated all of my symptoms, especially impulsivity. As a result of the mess of my life I have been battling severe depression. The narrative my brain created for the mess that was my life was that I was a screw up; that I lacked willpower or character; that I just failed at simple life skills. I was unhappy, had zero self love or value. I was living in abject squalor in a home that was foreclosed on. I didn’t have steady income and was planning on killing myself when the sheriff would finally come to kick me out and change the locks. Last year was particularly bad. I had one drunken suicide attempt, it was actually quite laughable. It was after a night of parting and I hit a pretty bad low. It was in the harshest part of the Montana winter and I decided to sleep in my car and die of exposure. It didn’t work; I woke up sober and cold, fight or flight in full affect. I rushed home and jumped in the shower to raise my core temp back to normal. A few of my closet friends could sense I was in a bad place and one hooked me up with a counselor who saw me pro bono. I saw her for a few sessions and got on an antidepressant. I stopped both after a month but managed to gain a little traction on my mood. I plugged away and read a few self help books. But without knowing the framework ADHD I didn’t accomplish much. I was able to find steady income and a rad place to live with a roommate that I worked on a few projects with. Eventually I got back with on of my ex-girlfriends. I told her about where I was a year ago, and she was very sad she wasn’t there for me. I also told her that I probably wasn’t ready for a relationship but if I was it would be her. My impulsivity got the best of me and we got back together anyway. Being in the relationship made me happy and boosted my self value. I was aware that you should never have your value outside of yourself—that it should come from within. But when you don’t have any value, it’s an easy trap to succumb to. She was planning on moving to go to a college that had a program she was interested in. I was going to go with her. It’s silly I would be throwing away all of the work, network, and social status I have her just so I can feel happy. She had been wanting to backpack in Europe over the summer and booked a cheep flight before telling me. I didn’t think mush of it because we planed on staying together and moving in when she got back. I asked her to give me till the end of the year to finish up some projects and see if we were compatible to live together. Just after I saw my GP for the first time, a week before my birthday, she broke up with me. I get it now but, it was never going to work. But at the time I was losing the only thing that made me happy, not only that, the source of happiness quickly became a source of pain. I sadly tried my best to fix the unfixable lol. Even the I was conscience enough to know what I had gotten myself into and did reasonably well transitioning back to single life. That is until a week or so later, while walking home for work (I work night so the is was a Saturday morning,) I saw her car at her ex boyfriends house, who lives 2 blocks away from me at the time. A few weeks go by and I keep drinking, the funny thing is one of the last convos I had with my ex was her telling me she was concerned about my drinking. I was annoyed by that and the conversation was cut short by a friend interrupting. I thought about that and the mess my life was and I realized the only time I ever thought or attempted suicide was when I was drinking. That was it. That’s what’s wrong with me. I have to stop, or one of these days I will be successful with suicide. I called a local rehab and was ready to go, my insurance didn’t cover it but I had enough money to pay for it myself. I worked it out with my job they were willing but they needed a prior diagnoses of alcoholism. I was in a catch 22. I could get the diagnoses at rehab but couldn’t go unless my job oked it. Rehab was just an impulsive decision, one I’m glad I din’t take. I talked with another close friend and he told me that rehab is more of a last case scenario when all else fails. He told me the people I was talking to at the rehab program were essentially salespeople and they wanted me to be health but also wanted my money. Plus going a way to a magic land where there is no booze is great but it might not help when I got back. He suggested AA. I quit drinking, found a sponsor, and starred doing AA. 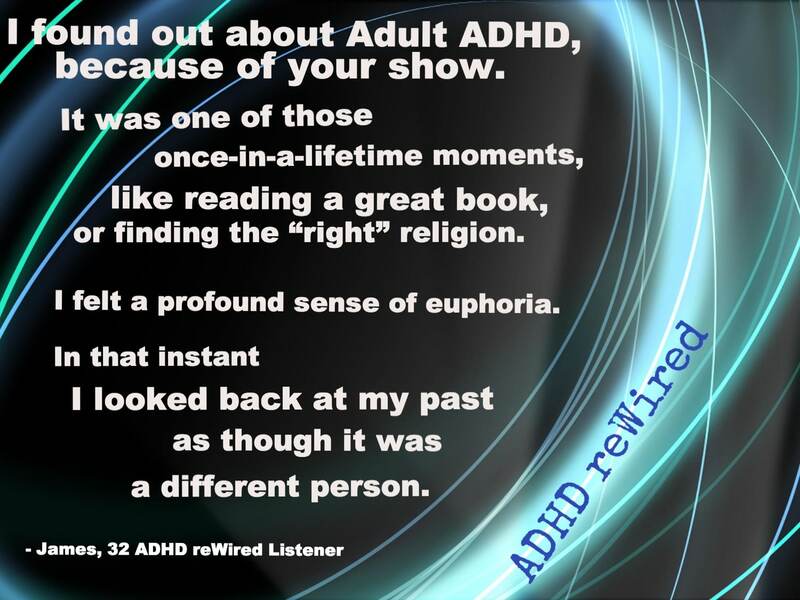 Then I found out about Adult ADHD, because of your show. It was one of those once-in-a-lifetime moments, like reading a great book, or finding the “right” religion. Reading the symptoms took all of the weight off my shoulders. I felt a profound sense of euphoria. In that instant I looked back at my past as though it was a different person. I immediately made a follow up appointment with my GP (one I was supposed to have already done, luckily I got an appointment a few days after.) I asked her about Adult ADHD. She prescribed me Dexedrine and from then on my life has been completely different. Ive only been medicated for half a month or so but it has made a huge difference. I have been reading all I can about the subject and am working hard to establish all in need in my life to be successful. I have a finical adviser; I’m seeing my counselor again, am eating right and exercising. Getting my life together. I even got a cpap machine for my sleep apnea. I feel amazing. While it would be silly and irrational to say I owe it all to you, I do feel that I found your podcast at just the right time and that it played an important part of my discovery of Adult ADHD. I suppose that is how it usually plays out for us. Anyway thanks! Keep up the good work! James and I talk for a while. Yeah… my first interview. Thank you for this. By the age of 19 I had a few attempted suicides that required hospitalization. And also 4 rehab processes. It’s been very hard. But with podcasts such as yours things are easier. Thank you Eric, for you work. I hope you get even more succesful you deserve it.